Editor's note: Putting nano-sized particles together to build specific things is, as one might imagine, not a very easy thing to do. Why? Because particles at that scale are subject to laws of physics that we never experience on a macro scale. Things tend to come together, or not, in ways that are highly complex and difficult to manage. (At this point I'm thinking about George Costanza and really tiny surgical instruments.) So Microsoft steps in and comes up with a computer model that concocts recipes for making the tiny particles into something useful. Making complex structures out of nanoparticles or polymers, be they for photonic computing or solar cells, typically involves a lot of expensive and time-consuming trial and error in the lab. Theorists hope to simplify the process by developing computer models that will generate recipes that always come out right, but so far, the ones that they've made have been too complex to realize in the lab. Now, in the hope of making these algorithms useful to chemists, computer scientists at Microsoft have simplified a model that creates recipes for self-assembling materials. "If you have in mind a form or shape, the model will tell you how to get it," says Henry Cohn, principal researcher at Microsoft Research New England, who led the work with MIT assistant professor of mathematics Abhinav Kumar. The new Microsoft models, described this week in the Proceedings of the National Academy of Sciences, are intended to speed the design of new self-assembled structures. Using trial and error, materials scientists have employed nanoparticles to make structures on what's called the mesoscale. These ordered arrangements of nanoscale particles can have remarkable optical, electrical, and other properties but are difficult to create. "Theory there is sorely lacking," says Mila Boncheva, a senior scientist at Firmenich, in Geneva, who played an important role in early research on this kind of self-assembly at Harvard University. "What people are currently doing in design is mostly trial and error based on common sense." 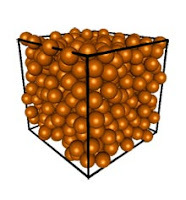 The theoretical model is aimed at helping materials scientists figure out much more quickly what the right materials and conditions are for self-assembly of a given structure.